The following list of Illinois public labyrinths will give you the information you need to enjoy visiting any of these public sites. Some are open by appointment (like the labyrinths at Relax4Life) while others are open sunrise to sunset or even 24 hours. We hope this list will give you new insight as to the labyrinths in your area that you didn’t know existed. To schedule an appointment, please call 847-842-1752. Note: Relax4Life is a fragrance-free environment. We ask that you refrain from wearing on your clothes or person any fragrances. We thank you for your consideration. Besides the outdoor walking labyrinths, there is a small labyrinth gift area inside the Center where you can browse our unique wood finger labyrinth designs and other labyrinth-related gift items. 27 foot, 5-circuit design composed of a base of asphalt screenings and beautiful hand-painted brick. Nestled just south of the parking lot behind the church. It is available from sunrise to sunset 7 days/week. All are welcome! For additional information, please contact: Tracy Hindman at sacredpath12@aol.com. 40 foot Chartres design composed of limestone-screenings and brick, located on the west end of the church property. 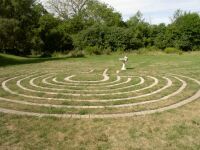 Elgin-Unitarian Universalist Church-1st Permanent Outdoor Labyrinth in Illinois (fall equinox 1997). 94 foot stone & Playwood Chartres pattern-recently restored with crushed limestone replacing the original playwood. 3 miles west of the intersection of Randall Rd. & Highland Ave. on Highland-on the right side of the road-church looks like a large modern barn; the labyrinth is just to the right of the back of the church. 7430 N. Ridge Blvd. Enter at the service drive. Go west on white gravel. The labyrinth is located west of the garden at the north end of campus. 60′ Mulch and stone, Classical 7-Circuit (Cretan) Design with bench in the center for resting/reflecting. The church is located on the border between Crystal Lake and Prairie Grove at the corner of Route 176 and Bayview Beach Rd. approximately 1 mile east of Valley View Rd. Turn left into the church parking lot via Bayview Beach Rd. and proceed east to the church and labyrinth. 42-foot, concrete, Chartres pattern-made using Labyrinth Enterprises proprietary polymer concrete technique. The labyrith is in the open air atrium accessed by the lower level which connects the old hospital, new hospital, and parking garage. Park in the new parking garage and walk down to the lower level. Open 24 hours. Marianjoy is located at 26W171 Roosevelt Rd. For information, call 630-909-8000. 18’ 4″ diameter Chelsea labyrinth paved with 3 tons of red tiles lies in a downtown garden of tranquility and peace, beside a stone Buddha statue. The walk from entry to center is 164’, and the round-trip journey allows time to retrace the path of one’s life or to contemplate the meaning of the day. In spring, the interstices will be planted with Purple Lemon carpet thyme, adding an additional sensory element to the experience. 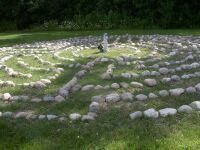 The labyrinth and garden were created in 2007 by TOWN (Taskforce on Waukegan Neighborhoods) and was a gift by the Fuquas. and contains plots of perennials, annuals, native plants, herbs and spectacular sunflower. 35 South Genesee Street. For more information, contact Nada 847-917-8310 or www.waukegan.com. Approximately 50 foot Classical 7-Circuit Cretan, made of round grey walking plates with river pebbles as the walls. The Theosophical Society is located just west of the intersection of Geneva Rd. and Main St. in Wheaton (Stop in at Quest Bookshop to see Relax4Life’s Finger Labyrinths). The labyrinth is located 1/2 a block south of Quest (just south and west of the vegetable gardens). Our labyrinth is a permanent 44 foot “garden” labyrinth, patterned after the one at Chartres Cathedral. St. Elisabeth’s offers it as a symbol of hospitality and blessing to the larger community. It is always open, and all are welcome! This labyrinth lies in a tree-enclosed corner of the church property, directly west of St. Elisabeth’s Rectory. Located just east of the 5-point intersection of South Street, Greenwood, and Hawthorn Ave., it is 2 blocks west of Green Bay Road. An informational leaflet is available at the entrance. 60+ foot diameter inlaid brick and grass Chartres design. 60-foot Cretan pattern, grass with blue walking path-open sunrise to sunset. 30 foot AllDeck surface, acrylic resin and fiberglass Chartres located on the terrace between the church and the diocese office building, 1 1/2 blocks from Michigan Avenue. Open 24 hours to the public. 65 E. Huron (between Rush & Wabash). 42 foot in-ground Chartres pattern made of granite cobblestones laid in a bed of sand and finely crushed limestone. Located about 1 1/4 miles north of Route 64 (North Ave.) on Route 25. Labyrinth is behind the church, 994 N. Fifth. Created by Sister Nancy and Marion Biagi, this 25-foot crushed granite and limestone based Cretan Labyrinth design with small, fist-sized rocks layed atop the granite and limestone, making up the path walls. The rocks/crystals are from around the world, and have and will continue to come from visitors to the labyrinth. Designed to be walked individually. 54 foot white limestone screen permanent Chartres design on asphalt. The rosette is blue limestone screen. A meditation garden surrounds it. 84-foot Chartres pattern mowed into the grass with fieldstone walls-open sunrise to sunset. Medieval 11-circuit design, paint on concrete. 22-ft. diameter. Near the corner of Fairchild St. and Logan Ave., across from Lakeview College of Nursing and Provena United Samaritans Medical Center. 110 foot Chartres design mowed into the prairie and the address is 20112 Hebron Rd. Harvard, IL 60033. It is 4 miles north of Harvard going on Rt. 14, then right on Hebron Rd. 1/3 mile to the Labyrinth sign. Cars can park right on the shoulder of the road. It’s a slowcountry road—then walk right in at the sign. Call Mary Klein 262-248-1916 Days or 815-943-4765 Eves. 7-circuit Cretan with crushed gravel path and grass borders. 36 foot, painted canvas, Chartres-style labyrinth layed out in the church beginning March 2, 2001 and available every Friday evening thereafter through April 6, 2001 from 6:00 p.m. until 9:00 p.m. Call the church for additional dates after April 6. 23 foot, Cretan design with inlaid paving stone “walls” and mulch paths. 911 Second Ave. From State St. in Rockford: turn south onto 6th St. and turn west onto 2nd Ave. and go 1/2 block. Labyrinth Garden on left behind church. Call 815-963-4815 for details. 40′ grass and stone, Santa Rosa design with bench in the center for resting/reflecting. Open 24 hours. There is a cafe and shop. Travel north from Alton on US67 toward Jerseyville for 5 miles. Pass Lewis and Clark Community College on left and take next left at Mulberry Street. The labyrinth is located behind Godfrey Congregational Church, 6104 Godfrey Road, opposite Josephine’s Tea Rooms. Ample parking and wheel chair accessible. For information call the church: (618) 466-3640. The Labyrinth is an 84-foot Chartres pattern mowed into the grass. Open sunrise to sunset. Directions: From Avenue of the Cities (formerly 42nd Avenue in East Moline), head north on 7th Street (toward downtown). Turn right on 25th Avenue and go two blocks. The church is on the left; park in the lot next to the church. The Labyrinth is located immediately across 25th Avenue from the parking lot. 777 25th Avenue. Pastor Rebecca Sherwood – (309) 755-1595 or http://www.fpcem.org/labyrinth.htm. 30′ grass and brick Classical, 7-Circuit. Open dawn to dusk. 5102 47th Avenue. Rev. Dean Van Wie 309-762-1066 or www.unityqc.org. http://www.charityadvantage.com/QuadCity_Labyrinth_ProjectAYSDYT/EventsCalendar.asp for list of current dates and times for labyrinth events. 60′ crushed stone Heart of Chartres design. On 257th Street, 1 1/2 miles off County Road Y4E between Wheatland and Big Rock.